A fascinating study conducted by the Washington Post affirmed the longstanding theory that there is a racial correlation to gun deaths in America. Principally, a white person is five times more likely to commit suicide with a firearm, than to become a homicide victim and a black person is five times more likely to be a homicide victim, than a suicide victim. “So quite simply, you know, for every white person shot in a homicide, five shoot themselves; and for every black person who shoots himself, five are killed by homicide,” said Dan Keating, the author of the study, who appeared on National Public Radio to discuss his findings. Looking at the gun deaths in America, roughly two-thirds are suicides and approximately one-third are homicides. To get specific, in 2010, there were 19,392 firearm-related suicide deaths and 11,078 firearm-related homicide deaths in the U.S., according to the National Center for Health Statistics. So, with that in mind, one of Keating’s central inquiries was: does access to firearms impact these numbers? That is to say, do states with higher rates of gun ownership have more suicides and/or homicides? Where a person lives matters, too. Gun deaths in urban areas are much more likely to be homicides, while suicide is far and away the dominant form of gun death in rural areas. 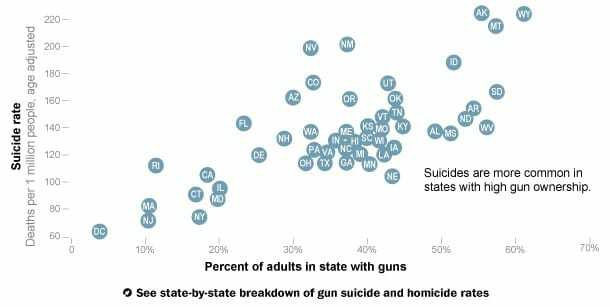 States with the most guns per capita, such as Montana and Wyoming, have the highest suicide rates; states with low gun ownership rates, such as Massachusetts and New York, have far fewer suicides per capita. In a way, Keating’s article pivots away from homicides and focuses mainly on suicides, which he believes is an underrepresented or overlooked aspect of the gun control debate. KEATING: …And I think there’s an amazing irony here that the media is often accused of making a big deal about white crime victims and ignoring black crime victims. But the truth of the matter is when it comes to gun crime, black crime is very much in the news, and politicians campaign on crime and safety and all these kind of issues. But the white people that are — you know, a lot more white people die from suicide than black people die from homicide with guns, but there’s — nobody campaigns on suicide. Nobody’s making a huge outcry about it, and the vast majority of these suicide deaths receive no publicity and no public discussion. So the fact of the matter is these deaths don’t generate — I think people are vastly unaware of how many white people kill themselves. And there’s all this discussion about what’s going on in the black community with all these homicides, but you don’t hear anybody saying what’s going on in the white community with all these people shooting themselves. What — you know, there’s no good reason that we can’t intervene and lower this suicide rate, but nobody’s talking about it. And so nobody’s making the connection between a ridiculously high rate that shouldn’t be there and access to guns and issues about mental health. People aren’t even making — we’re talking about, you know, is it one or the other or is it both? But people aren’t discussing any of it. So I think it’s because people keep it as a family thing. 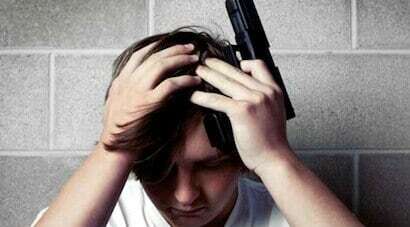 Well, is this true, do states with higher rates of gun ownership have more suicides? The short answer is: yes. So, the question is: why? Well, one theory is that suicidal individuals are impulsive. Consequently, when guns are readily available they have fewer roadblocks in their way to acting on that suicidal impulse. ROSENBERG: I think it’s really an important issue. There was a study done of young people who had very serious suicide attempts. These are people who shot themselves, who jumped from very high heights, who but for the grace of God would have died. And they asked these people how long they had considered committing suicide. There was a very small group who had been seriously, chronically depressed and had thought about this for a very long time. But the largest percentage of young people had thought about suicide for a very short period, for many of them less than five minutes. CHRISTINE: That’s exactly what I see in my practice. I hospitalize a lot of kids that are suicidal, and the correlation also between poor impulse control and drug and alcohol use plays a huge factor. ROSENBERG: Very big, and so the suggestion is that if you can prevent them from having access to the fatal means when they have the impulse — separate the impulse from the action — you can save their lives. And this is very, very important because if you have a waiting period, if people can’t buy a gun right away but have to wait a week, that reduces the number of suicides. There are things that work based on understanding the impulsive nature of suicide, especially in young people. However, when one looks at the international numbers on suicide that correlation breaks down. In other words, countries with higher rates of gun ownership do not necessarily have higher rates of suicide, something Keating conceded. KEATING: That is a very — it’s interesting, because when you go between countries, another example of it gets cited a lot of times that you could find prominently on the NRA website, for instance, is that Russia has very tight gun control, very few guns, but a very high suicide rate and a very high homicide rate. Whereas Israel, which has very high gun possession, has a very low suicide rate. Yeah. So when you get into the international — and India has a very high suicide rate and interestingly there it’s women, which is different than in the U.S., and there are certainly very important cultural reasons having to do with suicide with women in India. But the thing is, when you get into the international, you start to see very big cultural differences which I do not have good explanations for. Obviously, this discussion raises a lot of questions. Are there cultural differences between states that have high-rates of gun ownership and states that do not? Do people in Wyoming look at mental health and counseling differently than those in Massachusetts, i.e. is it more taboo to seek treatment for depression in Wyoming vs. Massachusetts? 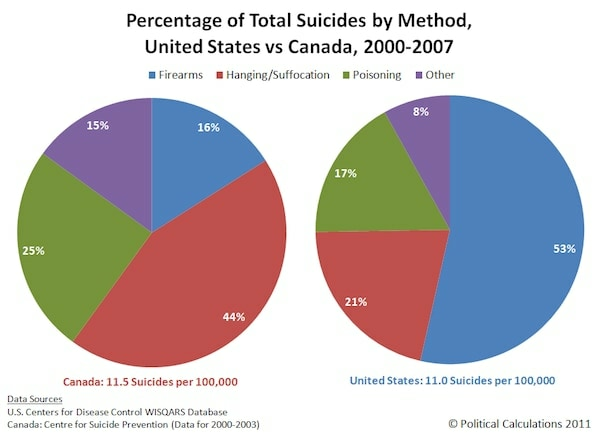 Suicide Rate: Canada vs. U.S.
Also, what role do veterans play in this research? Recent studies suggest that veterans account for as much as 21 percent of all suicides. Proportionally or on a per capita basis, are there more veterans at risk of committing suicide residing in rural areas as opposed to cities? Could this potentially impact the results of the study? Though, perhaps the best thing to take away from this research is to remind ourselves how important it is to safely secure our firearms. Remember, restricting access to firearms does not mean giving up one’s guns (at least not in my book). It means putting your firearms under lock and key. On this point, Eleanor Hamm who works for the Colorado suicide hotline agreed. On this front, gun owners need to be hyper-vigilant when it comes to those around us who may be suffering from depression or post-traumatic stress disorder or any other mental health ailment. We need to encourage our friends and family to seek out the help they need. Moreover, and as Keating noted in the NPR interview (which you should definitely listen to below), if you see someone that is troubled or that you think may be struggling with suicidal thoughts, don’t be afraid to reach out and ask them about it. Ask them if they need help and tell them you are available to talk if need be. Sometimes it’s the little things — going out for coffee or watching sports or just listening — that can have the biggest impact.